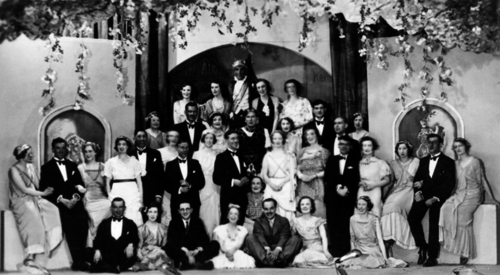 The Arcadians, 1937. March and April. There have been various names for the groups which put on plays and musicals in Cromer over the years. The relationship between the groups is not always clear but perhaps more information will come forward on this. The photographs on this particular page are of the productions of the Cromer and Sheringham Players. As ever we are indebted to Harry Hodges Tansley for keeping such a good record; he would take the photos and then print them onto ready printed postcard paper and doubtless collect orders from the cast. He also took the trouble to print the year, the production and often the dates of the production onto the card. The productions featured on these cards were generally put on in both Cromer and Sheringham, the Cromer venue being the Town Hall and the Sheringham venue being the Concert Hall. We suspect that it may now be difficult to put names on the faces in the photos from the 1930s but do use the 'Feedback' page if you can help.